Out of the many marketing channels available, email arguably delivers the best returns on investment (ROI). But success isn’t guaranteed given the mounting competition for your audience’s attention. And the state-of-art in email marketing is always changing, making it hard for marketers and business owners to keep up. To help, we have compiled 50 actionable email marketing tips that can be implemented today regardless of your experience level. Even experienced hands might learn something new. You can use the table of content below to pick out sections that you might be interested in. Never have we had so many ways to learn more about our subscribers: their preferences, their experience levels, their job titles, their likes and dislikes. So, make sure your subject lines are targeted toward your subscriber segments. Personalize the email based on what is most relevant to the specific subscriber base, and where they are at in their respective buying journey’s. You want to let your readers know that you know and you care about their needs. 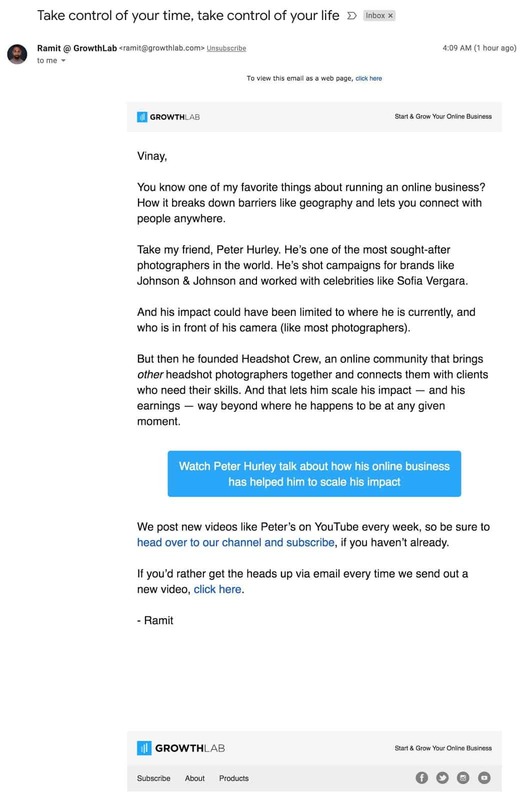 Here’s an example of a personalized subject line that works, from marketer Ramit Sethi. It clearly shows he knows that time is a scarce commodity for his audience. Getting an email from an actual person like nancy@yourcompany.com feels friendlier than one from a business or brand. So, use an employee’s name in the sender field. Sending an email from a real person creates the impression for recipients that they are hearing from a real person. If the “from” name is not someone your recipients know, or want to hear from, your subject line won’t matter. In the above example you would have noticed that Ramit Sethi uses Ramit @GrowthLab to let people know who are where the email is coming from. Subject lines are like a call to action (CTA) in that you want to use language that is persuasive and encourages people to click. Subject lines with action-oriented verbs and power words tend to be more enticing. By instilling exclusivity, urgency and excitement, the first subject line inspires the reader to open the email. The second is more generic and less actionable. According to a Yesware study, emails with subject lines containing numbers and statistics have a higher open rate and reply rate. Numbers and stats remove ambiguity and even if you find the data hard to believe you are likely to click to verify. Share the numbers up front in the subject line. One of the best ways to optimize your subject lines is to conduct A/B tests. Write two separate subject lines. Send the first to the first half of your subscribers and the second to the other half. Most email marketing service providers make this easy enough to do. Curiosity can be a powerful marketing tool. Jonna Weibe of Copyhacker used it to boost sign-ups by almost 1,000 percent. Incorporating it into your subject lines is as simple as identifying the beginning and the end of your story and then leaving out the crucial information in the middle. How do you create a sense of urgency? Offer something scarce, set a deadline or solve an unpleasant problem. Consider pairing an active and urgent word. Asking a compelling question can also draw readers to open your emails. 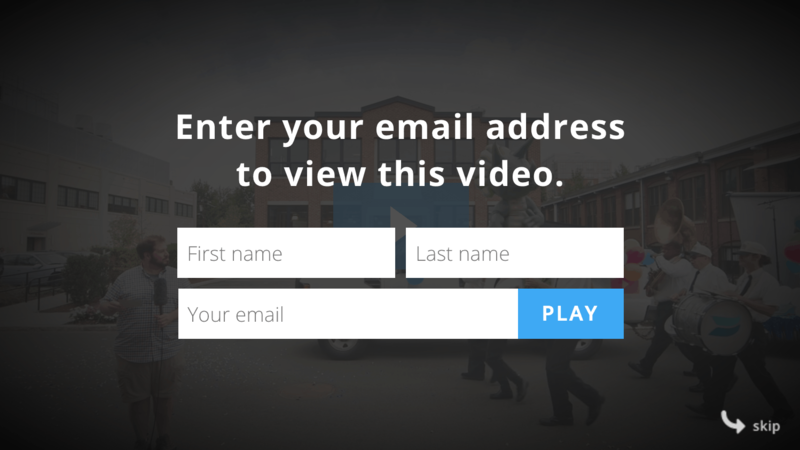 Questions help you enter an instant dialogue with users, making them more likely to be opened. Most email marketing service providers do offer the chance to fill out a preview pane with text. Leaving it blank is a missed opportunity as it offers a chance to provide more context. Tease an offer, then add more specifics. Include information that isn’t covered or implied in the subject line. Ask a question in your subject line and use the preview text to tease an answer. Getting an idea of how your subject line will fare would be great insight. Go to CoSchedule, which provides and email subject line tester that will score your subject line and suggest improvements. Do you read every word of every email? The reality is most of us skim through emails, looking for key points to decide whether to act. Sending longer emails just makes it harder for the recipient to glean the main message. A better approach would be to summarize and provide a link where readers can learn more. Social Media Today sends out a daily email that consists of the latest news. See how they keep each item brief with links to relevant pages. If you don’t follow through on what was promised in the subject line you will damage your credibility. The text of your email copy is your chance to continue the conversation and build it out to your call to action. Beware of using difficult words, “market-speak,” or technical jargon. Instead, write simply and conversationally while keeping your content powerful and to the point to grab and keep readers’ interest. Personalization, however, involves more than just inserting the recipient’s name in an email. Is this worth the readers’ time to look into? Is there something else that could add value to the email? Does the content clearly show an understanding of their needs? You may know the value of your offer, but your customers don’t. So, you need to explain it to them. Let your readers know what’s in it for them. Talk about the benefits of using your products or services, as opposed to just listing the features. This will help your readers understand why they should act. The word “you” is one of the most persuasive. So, put your reader first and write in the second person, using words such as you, your and yours. This keeps the focus on the reader and not on your business. Creating a seamless experience for your readers is critical to creating trust and keep them interested in exploring further. So, align your email copy with that of your landing pages. If your landing page has a different look and feel to the email and its copy, your readers are likely to leave confused. Use matching and compelling visuals and text. Make it easy for readers to understand your offer and what action you would like them to take. Your message isn’t just made up of words. You copy conveys personality and tone. Emotion is one of the key elements to creating successful online interactions. People want to feel connected to something. Your email copy, and that of related pages, is where you get that job done. 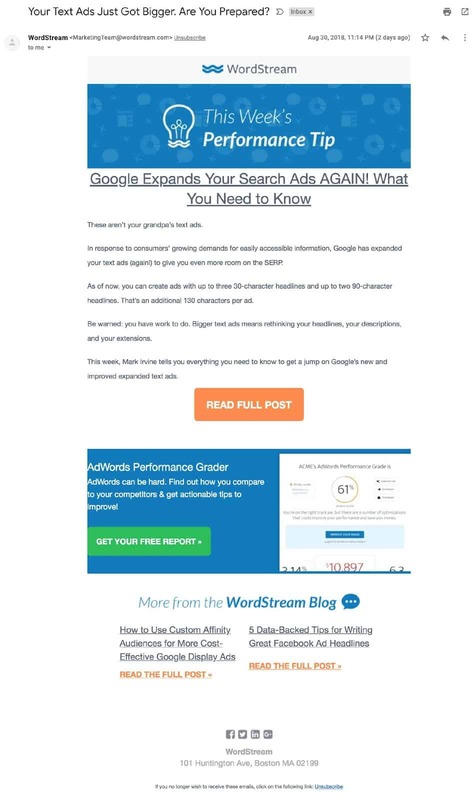 Here’s an example that shows how Wordstream engages their audiences. Be creative and leverage your branding and personality. You’ve worked hard to establish a tone of voice. Use it. If you stick to formulas and generic templates, you are likely to bore your audience. If you are writing a simple email or a plain text email, it is best to focus on a single call to action. But if you do have more to say, use the postscript. An exception would be newsletters and round-ups, which have several links. Brian Gardner of Studiopress, a company that creates and sells WordPress themes, sent an email in in which he concludes with a PS to make one final point. Once you craft a killer subject line and decide what you want to say, you need to create an email that can be viewed on a variety of devices. Web-based email clients may restrict the email from occupying the entire screen, so best to restrict your content to a wide of 800px or less. Logos, headers and footers are just some of the branding assets that you might use repeatedly on different email campaigns. To minimize the content creation process, you can create these assets and have them stored in a library. They can then be accessed and dropped in depending on the asset you are creating. With inboxes overflowing, readers often scan through emails in chronological order. This is where a visual hierarchy can help. Keep the most important information above the fold and use text formatting to highlight crucial points to help with quick scanning. The images in your email must be related to your copy. This is especially important as most email clients will disable images by default and so for a recipient to enable it the copy and image together need to relate. Emails with only one image as the content are likely to be flagged as spam. Shoot for at least an 80:20 text-to-image ratio. A newsletter full of text can appear to be boring and daunting to read. Images, on the other hand, can be a quick way of communicating with readers and keeping their attention. For certain email clients, though, this may not work as intended as they tend to resize or skew images. In such cases keeping your emails brief and planning for no images, or at least not embedding critical information in images, may be the better option. Also, if using a GIF ensure the first frame is not blank. Some email clients only display the first frame of your GIF. Your email copy is important. But so is the appearance of words in the email. So use correct font sizes and be consistent. Also, remember that web-embedded fonts won’t show properly in your emails so stick with more common fonts such as Times New Roman, Arial or Verdana. Sharing the story of your business’ growth can be a powerful way of connecting with your audience. Sharing behind-the-scenes stories of staff and customers or clients are just a few ways to let your audience be part of that story. 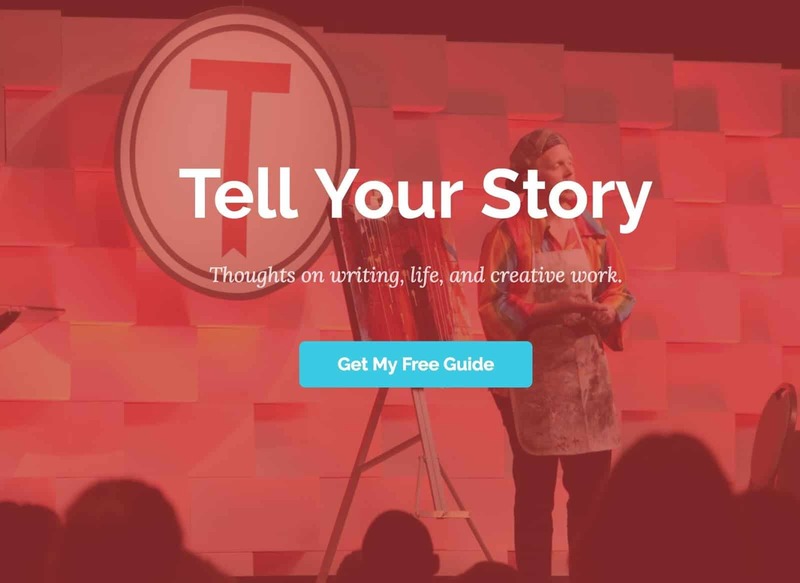 Another way to convey your story is to do so visually along with text. Don’t link to posts on your site. Most of your readers will likely only view the section of your email that is on the first screen – meaning, they won’t scroll further. It is here where they will make judgements about whether to read on. That’s why it’s important to place the call to action high in your email. Also, important: Making the CTAs large, recognizable and clickable. Your reader’s Internet connectivity is a factor as people are viewing content more on mobile phones. Include a “view online” link for HTML emails to allow for viewing as a webpage. As you develop your content be aware of how it will function when inserted into the email. Understanding and adding interactivity that will further the user experience is great. However, it is also important to remember that if the email doesn’t function the way it should on all email clients then it is better to have a plain text email. Most email marketing service providers provide a way to test how your email will appear on a variety of devices. Alternatively, you could use the Litmus email previewing feature. Once build your email list, the last thing you want to do is lose subscribers. But unsubscribe links are required to compliant with CAN-SPAM laws and GDPR requirements. Doing so creates a more positive experience and builds trust. Make the unsubscribe link as clear and easy to find as possible. 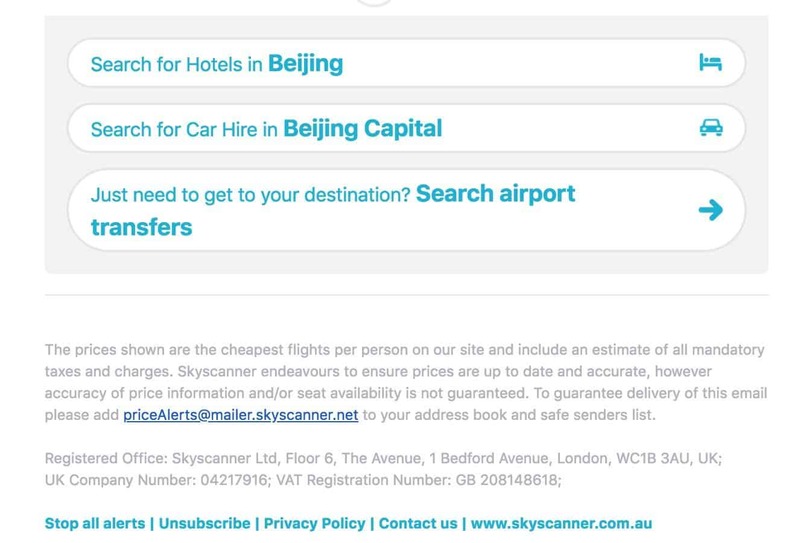 Here’s an example from Skyscanner, a site that compares flight and hotel options. The unsubscribe link is clear and easily found. The European Union’s GDPR regulations have changed the landscape for email marketing. To be compliant with this sweeping legislation, you shouldn’t purchase email lists. Part of that is practical – lists often have deliverability or other issues. But it’s also true that most of the people on these purchased lists won’t know why they are getting your emails and will likely mark them as SPAM or unsubscribe. You need to let your subscribers know what they can expect and what lists you will be putting them on. According to the Relevancy group, more than 98 percent of survey respondents reported owning a mobile device of some kind; and 86 percent reported accessing one or more email accounts via a mobile device. Research by Fluent shows that about 60 percent of consumers check their email on the go (mobile) and 75 percent of say they use their smartphones most often to check email. According to Litmus, mobile opens accounted for 46 percent of all email opens, followed by webmail opens at 35 percent, and desktop opens at 18 percent. The bottom line: You need both mobile-friendly emails, but also ones you can interact with on more traditional devices as well. We have covered several points to help create mobile friendly emails under the design tips section of this post which can get you off to a good start. The basics: you need to be using responsive templates and ensure that your content aids skimming or scanning. Inserting image-alt text tells email clients more about the nature of your content. This helps with accessibility issues for those who are visually impaired but also provides context for images if they don’t load in an email client. Add color and style your fonts to make them more attractive to your audience. 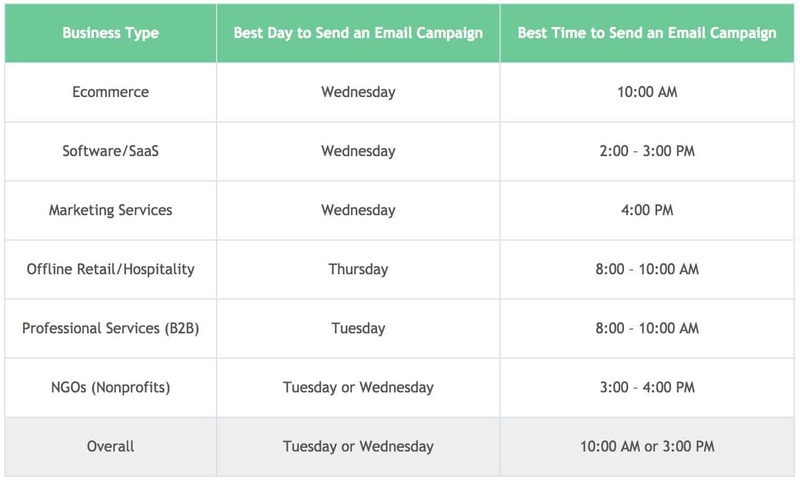 Many studies help identify the best times to send emails. For example, Infusionsoft tends to send emails earlier in the week. While these studies provide starting points for your campaigns, you need to learn what works for your audience. Make sure to test different times and days. The campaign analytics of your email marketing service provider will give you the data you need. Based on the above information you can then create a plan for sending emails and map out your content strategy and other elements accordingly. Using all capital letters in your subject line or email copy is considered shouting according to online etiquette. Chances are an all-caps subject line, or one with exclamation points, will get deleted or ignored. Most people prefer subject lines in lower case. Research by Phrasee, an AI marketing platform, found that the use of emojis in subject lines is on the increase. But does it help improve open rates? The research found that it works about 60% of the time and can increase open rates in such instances by 25%. To put it simply, emojis can make your subject lines worse or better depending on your audience and the context. In certain industries and contexts, it would be better to avoid emojis. Whether open rates are dropping once a certain number of emails are sent? The people on your email list will have unique needs, interests and backgrounds. Sending the same message to all these people won’t evoke the same level of interest and response from each one. A better strategy would be to break your list down into groups with certain common characteristics shared by your ideal clients. For example, people interested in marketing automation and integration are not likely to be interested in a website building webinar. To keep the interest of each segment you would need to send separate emails that address their needs and or interests. Most email marketing service providers allow for segmentation of your lists, so check their help guides for details. MailChimp, for example, provides a guide here. It can take a lot of work to get people on your list. So, it’s painful to take people off. At times that may be the best thing to do. People who do not open your emails or have become inactive aren’t interested and they have an adverse effect on your open rates and click through rates. To ensure you are sending emails to those who want to read them, clean out your list every so often to exclude those who haven’t opened your emails for a while. This will help ensure your open rates and click-through-rates are reflective of your most interested readers. You are also able to get better actionable data around what works and what doesn’t. A U.S. retailer targeted its email subscribers with email and Facebook ads. They found that those who received both were 22 percent more likely to make purchases than those who only received emails. Consider ways in which you can boost engagement using a combination of tactics beyond email or any single channel. For example, let’s consider the following scenario: A person downloaded a whitepaper and then saw an ad for a related webinar but didn’t act on it. You could follow up with an email about the webinar, explaining how it would help the person build on the value from the whitepaper. If readers on your email list are showing they like what you have to say, they’re probably inclined to want more. You just have to offer it to them. You could develop an ebook, video, whitepaper, webinar or some other content format around the same or related topic to get readers to subscribe to your list. Need ideas – check out this post. Nuzzle, a dog collar company, includes this form on its homepage and blog page. 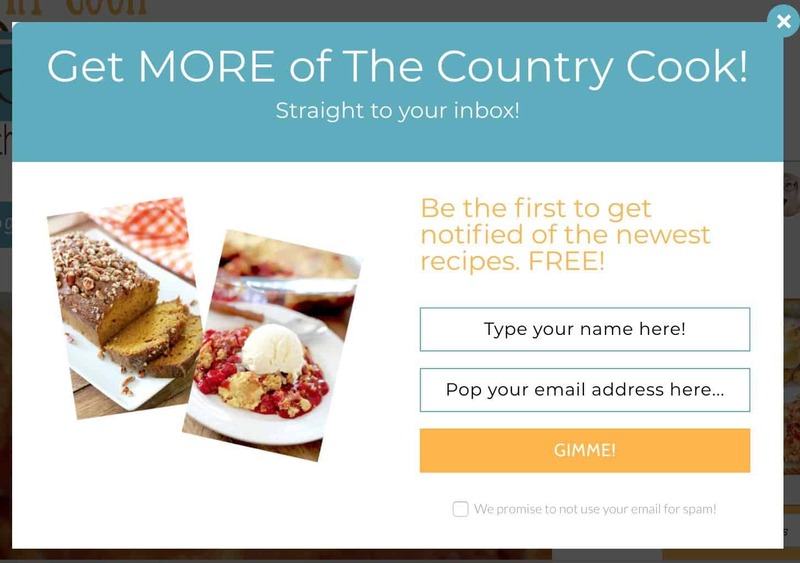 The Country Cook, a recipe site, uses this pop-up in addition to sign-up forms. Trust is an important factor as website visitors decide whether to opt-in or not. 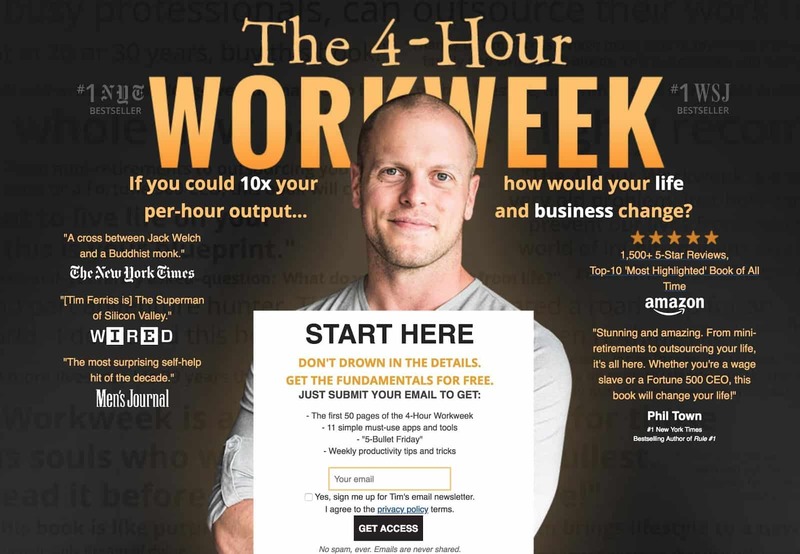 Providing social proof via a testimonial can help..
Tim Ferriss provides a great example of this on his fourhourweek.com home page. You and your team send out plenty of emails in the normal course of business. Regardless of whether those go to clients, prospects, vendors or someone else, a hyperlinked email signature to your sign-up form can lead to a steady increase in subscribers. Since you’re already in a natural email conversation with them, subscribing to get more value can be a natural next step. Human nature drives us to want to be winners. If you keep the barrier to entry low enough, you can build your email list rather quickly. It also serves as a great way to build your advertising and brand your services while exciting people to action. Promote your contests on social media to widen distribution and reach other influencers. Social media offers many ways to build a list. Take Facebook for example. You can create a sign-up button on your business page. But also consider the power of groups. Create a private Facebook Group with the entry requirement that you need to be a subscriber of your email list to join. You can include that criteria in your group description. As your group grows, so will your email list. The larger your group grows, the greater the social proof, and the more people will want to be a part of it. Your homepage is like the storefront window that allows people to look into your business. Research indicates that 86 percent of visitors are likely to explore more about your products or services simply because of your homepage. So, if your home page plays such a critical role in persuading your visitors, you’ll want to make sure you’re capturing email addresses while those visitors are showing an interest. If someone visits your home page, they are either aware of your business or brand or curious enough to learn more. They may see your site as an authority in the space and want to know how you can help them. What better way to build on that curiosity by asking them to subscribe? Here’s what Jeff Goins, an author and blogger, does to build his list. The very first thing you see on his home page is an opportunity to sign up for his free guide. Jeff has optimized the most viewed section of the home page, so that everyone has an immediate chance to sign up. You can check out Wistia’s guide for customization options and details. Pop-ups get a lot of hate. People complain about how annoying they are, but they work when used correctly. The fact is people have short attention spans. Also, with cart abandonment and bounce rates being as high as they are, you have to try to get the most of the traffic visiting your web pages. An exit-intent pop-up can help. 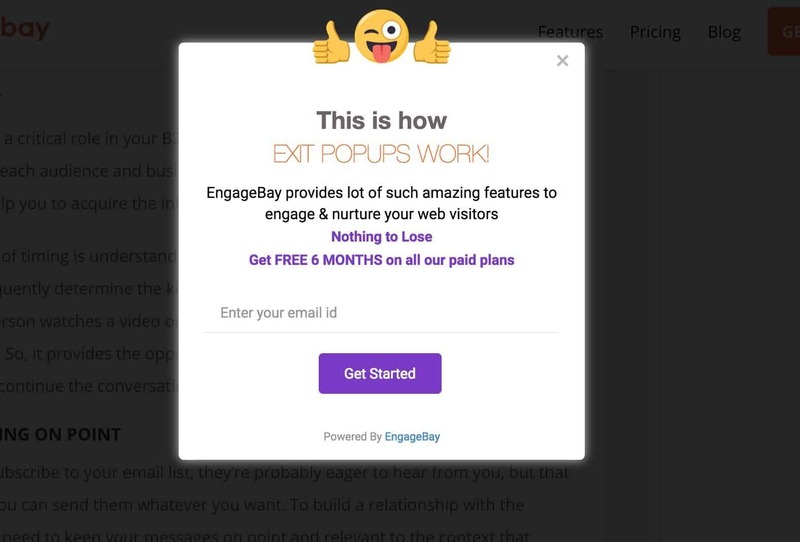 The technology behind these pop-ups sense when a person is about to leave the page and displays in a last attempt to get them to interact. If you’ve visited this blog before then you may have noticed that when you move away from the page, you get a pop up like the one below. If you have a sizeable Twitter following, many of them may not subscribed to your email list. Asking them to sign up should be an easy sell, given that they liked you enough to follow you on Twitter. On Twitter, you can pin a post like a lead magnet on top of your timeline. When visitors look at your profile, the pinned post will be the first post they see. 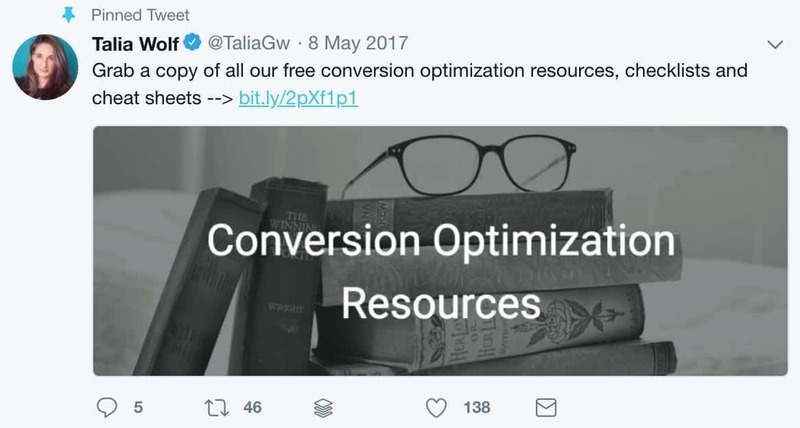 Here’s an example from Talia Wolf, a conversion optimization expert. Talia uses a link to direct people to a landing page, but you could also use a lead generation card. This creates a button and opt-in form right within the Twitter application. When you click on the “Subscribe Now” button, a popup appears asking you to subscribe. This makes opting into an email list easy for people as there is no need to click over to another page. This is a better option as it doesn’t risk losing people in the switch over and is likely to increase the conversion rate. Every person who signs up to your email list is giving you a vote of confidence to send further information/updates. This is not something to be taken lightly. You are in a fierce competition for attention. Also, your subscribers’ time is precious. You’ll must prove value to your readers consistently. You can only do that by knowing them well enough to identify with and empathize with their struggles. It is only when your subscribers know you, like you and trust you, and see that the same is true from you, that you can hit send and expect to grow your business. This is some really good content Vinay. I really like the email list building tips. You should make them into a separate article and explore even more creative ways to build email list. Kudos!